Evan's Kitchen & Catering - With more than 35 years experience, you can trust Chef Evan Elsberry as your wedding caterer. Our goal is to delight your taste buds with delicious and inspired dishes. Chef Evan has won several cooking competitions including the first State Fair competition in 2004 and the 2011 Sacramento Celebrity Chef Challenge. Contact Georgett at 916-412-1025 or Send an Email For more informaiton, visit our Website. Griselda's Catering - Our professional Sacramento catering services strive to make every event unforgettable. Our many catering services include everything from fully catered wedding receptions, graduations, holiday parties, corporate functions, catered food on your airplane and much more. 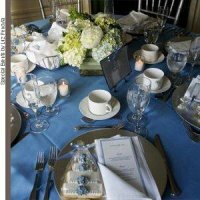 Our full catering service offers a diverse menu, anything from breakfast buffets to cocktail hors d'oeuvres. Contact us at 916-443-7313 or Send us an Email Visit Griselda's Catering website. Hannibal's Catering & Events is the most award winning caterer in the Sacramento region. We create wedding receptions like no other and your guests will notice the difference. We cater all over the Sacramento region offering full bar services, linens, rentals, staff, and above all amazing food and impeccable service! Directory: (Primary Wedding Associate/ Social/ Corporate): Sabrina Garecht sabrina@hannibalscatering.com #916-638-4363 (Weddings/ Social) Elisabeth Johnson elisabeth@hannibalscatering.com #916-638-4363 (Weddings/ Corporate) Catherine Treadway catherine@hannibalscatering.com #916-638-4363Contact us at 201-601-3777 or Send an Email Or visit the Hannibal's Catering & Events website. Jackson Catering & Events - As a Chef-owned and operated company, our primary concern has always been to provide the freshest, highest quality cuisine for all of our events. We stand behind all our menus and services, and invite you to see for yourself! We are honored to have recently been selected as Caterer of the Year for the fourth consecutive year by the National Association of Catering & Events, Sacramento chapter. Contact us at 916-483-7300 or Send us an Email For more information, visit our Website. Randy Peters Catering -Full service caterer and complete bar service. Give your guests the memory of a lifetime with our innovative menus and elegant presentation. Contact us today at 916-726-2339 or send an Email. For examples of our presentations and more information, visit our Website. Rayna's Gourmet Catering is the only caterer in town able to give you the quality prepared foods and the exceptional customer service you expect. With our catering experience and professional staff we will create an event you and your guests will truly never forget. Our team will handle every aspect of your event. Personalized menus and gorgeous décor tailored to your desires. Whether you’re planning an intimate dinner for 25, or celebration for 2,000, all special occasions are unique, personal, and once-in-a-lifetime. Contact us today at 916-385-7533 or send an Email. For more information, visit the Rayna's Gourmet Catering website. Smokin' Yankee's BBQ & Catering started out as a family BBQ Competition team in 2008. In 2010 we ranked #1 in California for Chicken and Ribs. Our Smoked Chicken, Brisket Chili and Sweet Yankee Beans are mouth watering and our meats are slow cooked to perfection. Our prices reflect the quality you will only get from Smokin Yankees BBQ & Catering. Custom packages available or choose from three wedding packages. Call us today at 209-471-4858 or send us an Email Please visit our Website.